Little Roo doesn’t want to get out of Mummy’s pouch – but she’s getting far too big to be carried. How can Mum encourage her to take the plunge into the big wide world? 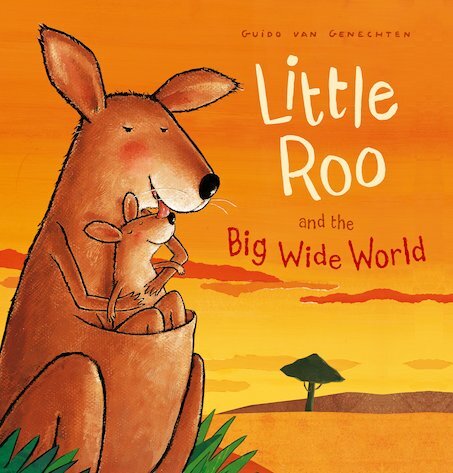 Luckily, Mummy has a clever idea… and when she takes Little Roo hoppity-hoppity-hopping all around the world, soon Little Roo can’t wait to go exploring all by herself! Bursting with prairie colours and glowing pastel artwork, this reassuring story celebrates the special bond between parents and tots, as well as the freedom that independence brings. Helping children to pluck up the nerve to explore new situations, it’s a gorgeous treat for children who find it hard to let go of Mummy’s hand – and for mums who find it hard to let go too! Author/illustrator Guido van Genechten has achieved international acclaim for his many picture books. His work has won prizes for illustration and has been translated into over 20 languages. Guido lives and works in Belgium. Guido van Genechten has won a number of awards in Europe, including the Readers Digest Award for Best Children’s Book Illustrator.